The Church in her love and wisdom exhorts us to prepare ourselves for the reception of the Holy Mysteries. We are told to come to confession, to seek it regularly, but without a concrete plan of action. Pastors will preach about frequent confession, and there are pamphlets and documents that speak of this, but what does this entail? Without supplanting the advice of a wise spiritual father (or mother), I would like to offer some thoughts to help you in your journey of faith, from the Church herself. First, let us remember what confession is. Without getting into the long history of development regarding this Mystery of the Church, Confession is, like all the other sacraments a public work of the Church. It may be surpsising to many, but Confession is liturgy. 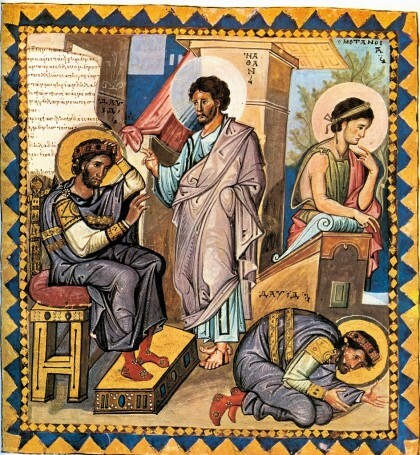 Perhaps the expression is more apparent in the Byzantine tradition, where the service takes place before the Icon of Christ in the nave of the church, and the presbyter leads the penitent in the Trisagion prayers that are common to all Byzantine liturgies. Then there is a set form of dialogue that is followed, where the presbyter asks on behalf of the Church, whether that penitent is sorry for his sins and has done all he or she has to forgive others. The penitent answers, and then there are the prayers of absolution, reconciling the penitent the Body of Christ. It is the same in the Latin tradition; there are prayers and a form that is to be followed (like all liturgies), a dialogue with the presbyter who stands as both minister and witness for the Church, and the prayers of absolution. In the Confessional liturgy there is the expectation that the priest and penitent will enter into a service together as set out by the Church for the expressed desire that through a public act of faith, the healing of the community may take place. In enterting a public form of worship the faithful may learn something of the nature of God through carefully selected prayers, rather than a freeform hug-circle. If we begin to see Confession less as a requisite thing that must be done for Communion and more as a regular service in our spiritual life, we will see it less as a clandestine meeting to expunge oneself of all the guilt and shame a person has acquired thorugh their falings. Lastly, let us not forget that in Confession we praise God for his mercy, we thank God for his love, and we beseech God for his grace. All things we do in other liturgies of the Church. As liturgy, Confession should be regular, just like the Hours and the Mass. In her canons, the Church has exhorted the faithful to participate in Confession at least once a year. But this is just the minimum, and no saints were ever made from doing just the minimum. Whether or not we have fallen into Grave sin should not dictate when we go to Confession. This lends itself to scrupulosity on the one hand, and sloth on the other. Rather, the saints have all encouraged the faithful to make a regular confession, and if we are aware of Grave sins, to come to the Sacrament immediately in between our regular rule of Confession. "I believe and profess, that you are the Christ, the son of the Living God, come to this world to save sinners, of whom I am the greatest... wherefore I pray to you, have mercy on me, and pardon my offenses, the deliberate and the in-deliberate, those committed in word and in deed, whether unknowingly or inadvertently." So how often should you go? Well the three most frequent exhortations for what is often referred to as frequent or regular Confession are : One month, every two weeks, or every week. St. Symeon of Thessalonica, and St. Francis De Sales exhorted their faithful to participate in Confession monthly. St. John Vianney and St. Kosmas Aitolos also recommended monthly confession, but also advised some of their faithful to go every two weeks and weekly if they were disposed to it. From the lives of the saints we learn that St. John Paul II, and St. Teresa of Avila would confess every other week. Blessed Mother Teresa of Calcutta and C.S. Lewis (though he was an Anglican) would confess weekly. The rule you choose should be discussed with your Spiritual Father. If your Spiritual Father (or Mother; I say this because some of the nuns I've met have been far wiser than some of the Priests and Deacons I've come across) says you should come less often, follow their direction. If they think you should come more frequently, do that too. However, if you are starting out, and have no Spiritual Father to speak to, I would choose a rule that you can commit too. This should take into account one's sense of preparedness as well as being able to maintain a reagular commitment. Find a regular time to go to Confession at and put it on your calendar. This will help make it a regular practice. If you find yourself unable to spiritually participate in weekly Confession, ease back. One should not fear the Mystery. However, strive for a regular rule of Confession. As St. John of Kronstadt says: "The longer we go without confessing, the worse it is for us, and the more entangled we become in the bonds of sin, making it more difficult for us to give account."